The Rev. Dr. Marjorie Gerbracht-Stagnaro joined the staff of Grace Episcopal Church as Priest-In-Charge on July 9, 2011, at an ice cream social, then preached and celebrated for the first time on Sunday, July 10th. She came from a thirteen year ministry at St. Patrick’s Episcopal Church and Day School in Washington, DC, where she was Day School Chaplain and Associate Rector. Prior to that, Marjorie was the Canon for Youth and Children’s Ministries for three years at Christ Church Cathedral in Cincinnati, Ohio. 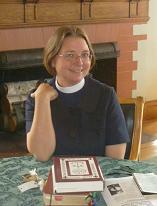 Marjorie received a BA in Classics from The University of the South (Sewanee) in 1992, a Masters of Divinity from the General Theological Seminary in New York City in 1995, and a D.Min. in Congregational Development from Seabury-Western Theological Seminary in 2008. She is married to Brent Stagnaro, an architect and inventor, and they are the proud parents of Fiona, age 7, and Zachary, age 6. Marjorie was installed (though she thinks makes her sound like a dishwasher, not a pastor!) as the Rector of Grace Episcopal Church on October 9th, 2013. She enjoys travel, knitting, crocheting, English penny quilting, reading, doing things for others, and spending time with her family. What she loves most about working at Grace Episcopal is the diverse and dynamic nature of the congregation and how every day she learns something new about God and herself. Deacon Mike came to Grace in September of 2018. After being a lifelong Lutheran, he was received into the Episcopal Church in June of 2009 by Bishop Robinson. Deacon Mike graduated from the Province I School for Deacons in June of 2108 and on June 16th he was ordained to the diaconate. He is also a graduate of the Education For Ministry program, also known as EfM. He and his wife Pat live in Deerfield where they have been for over 30 years. They have 4 grown children, and 10 grand kids. Deacon Mike received a Bachelor of Science Degree in Computer Science from Franklin Pierce University and for the last 8 years, has been working as a Tech Support Engineer at Oracle Corporation. For the last 3 years he has been volunteering with Chaplain Service at the VA medical center in Manchester. He finds visiting with these veterans to be very rewarding. Susan Senneville, our nursery care provider, has given our little ones at Grace Church consistent, loving care since 1984. She has a Bachelor of Science degree in Early Childhood Education, with a minor in Psychology, from the University of New Hampshire. She has had experience working with infants to pre-teens, having worked at an infant center, alternative school, and a resource room at a public school to day care centers, teaching pre-school. She has been teaching pre-school/kindergarten in her home for the past several years, on a smaller, more personal level. Having raised two daughters has also provided her with much insight. Susan has also been noted for her patience and for treating children as she would her own. She provides quality care at Grace Church for children up to three years of age. The safe, cheery, environment at the nursery allows parents to enjoy Mass in its entirety without having to worry. Parents are respectfully requested to volunteer on a once a month basis to assist. It’s a fun way to contribute. Come check it out! 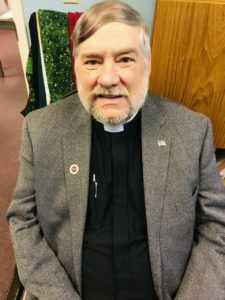 In addition to the Rector and Curate, several Episcopal/Anglican priests reside in the parish and occasionally assist with pastoral duties: The Reverends John Yen (pastor to the Sudanese community), Allan Knight, Jane Van Zandt, and Wesley Wasdyke. Please note: the email addresses on these pages are links which will work with Microsoft Outlook and Windows Mail email clients. If you use webmail or another email client, please copy and paste the address into the “To:” field in your message.